Jeremy Grantham quarterly letter is always enjoyable thanks to the deep analysis it contains. The July one is a must read. Many times, Jeremy expressed his deep disbelief about the size the banking industry reached in the West and the lack of benefit for the economy as a whole but the few taking advantage of it via insane bonuses. His mea culpa is just a few words but worth their weigh. "My previous argument in the Economist debate* was that the 3% of GDP that was made up of financial services in 1965 was clearly sufficient to the task, the proof being that the decade was a strong candidate for the greatest economic decade of the 20th century. We should be suspicious, therefore, of the benefits derived from the extra 4.5% of the pie that went to pay for financial services by 2007, as the financial services share of GDP expanded to a remarkable 7.5%. This extra 4.5% would seem to be without material value except to the recipients. Yet it is a form of tax on the remaining real economy and should reduce by 4.5% a year its ability to save and invest, both of which did slow down. This, in turn, should eventually reduce the growth rate of the non-financial sector, which it indeed did: from 3.5% a year before 1965, this growth rate slowed to 2.4% between 1980 and 2007, even before the crisis." Interesting enough, during the June G20 meeting held in Toronto, Hu Jintao, the Chinese Prime Minister, called for uniform methodologies and standards for sovereign credit ratings so that "rating results can accurately reflect the state of a country's economy and credit worthiness." One may wonder whether this rating list is not a subtle way to send a message to the West, and the USA in particular, which Asians are experts in. There are not much details about the methodology used, but from what I read on Dragon's web site, more emphasis is put on solvency and less on a stable political situation (read democracy). 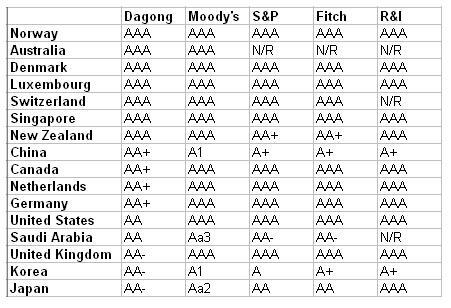 China is cleverly using the failure of US rating agencies with the subprime dabacle to get in, and Europe, as usual is absent despite comments made and decisions taken (?) about creating a European based rating agency for the past few months (such an attempt, from memory during in the late 90s, did not succeed). I provide below an extract of the 50 countries rated by Dragon. France and Britain are justifiably stripped from their AAA western engineered rating. I publish in extenso an interesting analysis from STRATFOR concerning the European banking and sovereign crisis. I am in agreement with everything written. In the last six months, the eurozone has faced its biggest economic challenge to date — one sparked by the Greek debt crisis which has migrated to the rest of the monetary union. But well before the sovereign debt crisis, Europe was facing a full-blown banking crisis that did not seem any closer to being resolved than when it began in late 2008. With investors and markets focused on European governments' debt problems, the banking issues have largely been ignored. However, the sovereign debt crisis and banking crisis have become intertwined and could feed off each other in the near future. July 1 is a milestone for eurozone banks, with 442 billion euros ($541 billion) worth of European Central Bank (ECB) loans coming due. The loans were part of the ECB's one-year liquidity offering made in 2009, which was intended to help stabilize the banking system. However, one year after the ECB provision was initially offered, the eurozone's banks are still struggling, and now Europe's banks must collectively come up with the cash roughly equivalent to Poland's gross domestic product (GDP). Fears regarding the potentially adverse consequences of removing ECB liquidity are gripping many European banks and, by extension, investors who were already panicked by the sovereign debt crisis in the Club Med countries (Greece, Portugal, Spain and Italy). These concerns are as much a testament to the severity of the eurozone's ongoing banking crisis as to the lack of resolve that has characterized Europe's handling of the underlying problems. Europe's banking problems precede the eurozone's ongoing sovereign debt crisis and even exposure to the U.S. subprime mortgage imbroglio. The European banking crisis has its origins in two fundamental factors: euro adoption in 1999 and the general global credit expansion that began in the early 2000s. The combination of the two created an environment that inflated credit bubbles across the Continent, which were then grafted onto the European banking sector's structural problems. In terms of specific pre-2008 problems we can point to five major factors. Not all the factors affected European economies uniformly, but all contributed to the overall weakness of the Continent's banking sector. The adoption of the euro — in fact, the very process of preparing to adopt the euro that began in the early 1990s with the signing of the Maastricht Treaty — effectively created a credit bubble in the eurozone. As the adjacent graph indicates, the cost of borrowing in peripheral European countries (Spain, Portugal, Italy and Greece in particular) was greatly reduced due, in part, to the implied guarantee that once they joined the eurozone their debt would be as solid as Germany's government debt. In essence, euro adoption allowed countries like Spain access to credit at lower rates than their economies could ever justify based on their own fundamentals. This eventually created a number of housing bubbles across Europe, but particularly in Spain and Ireland (the two eurozone economies currently boasting the relatively highest levels of private-sector indebtedness). As an example, in 2006 there were more than 700,000 new homes built in Spain — more than the total new homes built in Germany, France and the United Kingdom combined, even though the United Kingdom was experiencing a housing bubble of its own at the time. It could be argued that the Spanish case was particularly egregious because Madrid attempted to use access to cheap housing as a way to integrate its large pool of first-generation Latin American migrant workers into Spanish society. However, the very fact that Spain felt confident enough to attempt such wide-scale social engineering indicates just how far peripheral European countries felt they could stretch their use of cheap euro loans. Spain is today feeling the pain of a collapsed construction sector, with unemployment approaching 20 percent and with the Spanish cajas (regional savings banks) reeling from their holdings of 58.9 percent of the country's mortgage market. The real estate and construction sectors' outstanding debt is equal to roughly 45 percent of the country's GDP. "Carry trade" usually refers to the practice in which loans are taken in a low interest rate country with a stable currency and "carried" for investment in the government debt of a high interest rate economy. The European practice, which extended the concept to consumer and mortgage loans, was championed by the Austrian banks that had experience with the method due to their proximity to the traditionally low interest rate economy of Switzerland. In the carry trade, the loans extended to consumers and businesses are linked to the currency of the country where the low interest loan originates. Because of this, Swiss francs and euros served as the basis for most of such lending across Europe. Loans in these currencies were then extended as low interest rate mortgages and other consumer and corporate loans in higher interest rate economies in Central and Eastern Europe. Since loans were denominated in foreign currency, when their local currency depreciated against the Swiss franc or euro, the real financial burden of the loan increased. This created conditions for a potential economic maelstrom at the onset of the financial crisis in 2008 when consumers in Central and Eastern Europe saw their monthly mortgage payments grow as investors pulled out from emerging markets in order to "flee to safety," leading these countries' domestic currencies to fall. The problem was particularly dire for Central and Eastern European countries with a great amount of exposure to such foreign currency lending (see adjacent table). The carry trade led Europe's banks to be overexposed to Central and Eastern European economies. As the European Union enlarged into the former Communist sphere in Central Europe, and as security and political uncertainties in the Balkans subsided in the early 2000s, European banks sought new markets where they could make use of their expanded access to credit provided by euro adoption. Banking institutions in mid-level financial powers such as Sweden, Austria, Italy and even Greece sought to capitalize on the carry trade by going into markets that their larger French, German, British and Swiss rivals largely shunned. This, however, created problems for the banking systems that became overexposed to Central and Eastern Europe. The International Monetary Fund and the European Union ended up having to bail out several countries in the region, including Romania, Hungary, Latvia and Serbia. And before the eurozone ever contemplated a Greek or eurozone bailout, it was discussing a potential 150 billion-euro rescue fund for Central and Eastern Europe at the urging of the Austrian and Italian governments. The exposure to various credit bubbles ultimately left Europe vulnerable to the financial crisis, which peaked with the collapse of Lehman Brothers in September 2008. But the outright exposure to various financial derivatives, including the U.S. subprime market, was by itself considerable. While the Swedish, Italian, Austrian and Greek banking systems expanded into the new markets in Central and Eastern Europe, the established financial centers of France, Germany, Switzerland, the Netherlands and the United Kingdom dabbled in various derivatives markets. This was particularly the case for the German banking system, where the Landesbanken — banks with strong ties to regional governments — faced chronically low profit margins caused by a fragmented banking system of more than 2,000 banks and a tepid domestic retail banking market. The Landesbanken on their own face between 350 billion and 500 billion euros worth of toxic assets — a considerable figure for the 2.5 trillion-euro German economy — and could be responsible for nearly half of all outstanding toxic assets in Europe. Another problem for Europe is that its long-term outlook for consumption, particularly in the housing sector, is dampened by the underlying demographic factors. Europe's birth rate is at 1.53, well below the population "replacement rate" of 2.1. Exacerbating the demographic imbalance is the increasing life expectancy across the region, which results in an older population. The average European age is already 40.9, and is expected to hit 44.5 by 2030. An older population does not purchase starter homes or appliances to outfit those homes. And if older citizens do make such purchases, they are less likely to depend as much on bank lending as first-time homebuyers. That means not just less demand, but that any demand will depend less upon banks, which means less profitability for financial institutions. Generally speaking, an older population will also increase the burden on taxpayers in Europe to support social welfare systems, dampening consumption further. In this environment, housing prices will continue to decline (barring another credit bubble, which would of course exacerbate problems). This will further restrict lending activities because banks will be wary of granting loans for assets that they know will become less valuable over time. At the very least, banks will demand much higher interest rates for these loans, but that too will further dampen the demand. Given these challenges, the European banking system was less than rock-solid even before the onset of the global recession in 2008. However, Europe's response as a Continent to the crisis so far has been muted, with essentially every country looking to fend for itself. Therefore, at the heart of Europe's banking problems lie geopolitics and "capital nationalism." Europe's geography encourages both political stratification and unity in trade and communications. The numerous peninsulas, mountain chains and large islands all allow political entities to persist against stronger rivals and continental unification efforts, giving Europe the highest global ratio of independent nations to area. Meanwhile, the navigable rivers, inland seas (Black, Mediterranean and Baltic), Atlantic Ocean and the North European Plain facilitate the exchange of ideas, trade and technologies among the disparate political actors. This has, over time, incubated a continent full of sovereign nations that intimately interact with one another but are impossible to unite politically. Furthermore, in terms of capital flows, European geography has engendered a stratification of capital centers. Each capital center essentially dominates a particular river valley where it can use its access to a key transportation route to accumulate capital. These capital centers are then mobilized by the proximate political powers for the purposes of supporting national geopolitical imperatives, so Viennese bankers fund the Austro-Hungarian Empire, for example, while Rhineland bankers fund the German Empire. With no political unity, the stratification of capital centers becomes more solidified over time. The European Union's common market rules stipulate the free movement of capital across the borders of its 27 member states. Theoretically, with barriers to capital movement removed, the disparate nature of Europe's capital centers should wane; French banks should be active in Germany, and German banks should be active in Spain. However, control of financial institutions is one of the most jealously guarded privileges of national sovereignty in Europe. One reason for this "capital nationalism" is that Europe's corporations and businesses are far less dependent on the stock and bond market for funding than their U.S. counterparts, relying primarily on banks. This comes from close links between Europe's state champions in industry and finance (for example, the close historical links between German industrial heavyweights and Deutsche Bank). Such links, largely frowned upon in the United States for most of its history, were seen as necessary by Europe's nation-states in the late 19th and early 20th centuries because of the need to compete with industries in neighboring states. European states in fact encouraged — in some ways even mandated — banks and corporations to work together for political and social purposes of competing with other European states and providing employment. This also goes for Europe's medium-sized businesses — Germany's mid-sized businesses are a prime example — which often rely on regional banks they have political and personal relationships with. Regional banks are an issue unto themselves. Many European economies have a special banking sector dedicated to regional banks owned or backed by regional governments, such as the German Landesbanken or the Spanish cajas which in many ways are used as captive firms to serve the needs of both the local governments (at best) and local politicians (at worst). Many Landesbanken actually have regional politicians sitting on their boards while the Spanish cajas have a mandate to reinvest around half of their annual profits in local social projects, tempting local politicians to control how and when funds are used. Europe's banking architecture was therefore wholly unprepared to deal with the severe financial crisis that hit in September 2008. With each banking system tightly integrated into the political economy of each EU member state, an EU-wide "solution" to Europe's banking problems — let alone the structural issues, of which the banking problems are merely symptomatic — has largely evaded the Continent. While the European Union has made progress in enhancing EU-wide regulatory mechanisms by drawing up legislation to set up micro- and macro-prudential institutions (with the latest proposal still in the implementation stages), the fact remains that outside of the ECB's response of providing unlimited liquidity to the eurozone system, there has been no meaningful attempt to deal with the underlying structural issues on the political level. EU member states have, therefore, had to deal with banking problems largely on a case-by-case (and often ad hoc) basis, as each government has taken extra care to specifically tailor its financial assistance packages to support the most and upset the fewest constituents. In contrast, the United States — which took an immediate hit in late 2008 — bought up massive amounts of the toxic assets from the banks, swiftly transferring the burden onto the state. Europe's banking system obviously has problems, but exacerbating the problems is the fact that Europe's banks know that they and their peers are in trouble. This is causing the interbank market to seize up and thus forcing Europe's banks to rely on the ECB for funding. The interbank market refers to the wholesale money market that only the largest financial institutions are able to participate in. In this market, the participating banks are able to borrow from one another for short periods of time to ensure that they have enough cash to maintain normal operations. Normally, the interbank market essentially regulates itself. Banks with surplus liquidity want to put their idle cash to work, and banks with a liquidity deficit need to borrow in order to meet the reserve requirements at the end of the day, for example. Without an interbank market there is no banking "system" because each individual bank would be required to supply all of its own capital all the time. In the current environment in Europe, many banks are simply unwilling to lend money to each other, as they do not trust their peers' creditworthiness, even at very high interest rates. When this happened in the United States in 2008, the Federal Reserve and Federal Deposit Insurance Corporation stepped in and bolstered the interbank market directly and indirectly by both providing loans to interested banks and guaranteeing the safety of the loans banks were willing to grant each other. Within a few months, the U.S. crisis mitigation efforts allowed confidence to return and this liquidity support was able to be withdrawn. The ECB originally did something similar, providing an unlimited volume of loans to any bank that could offer qualifying collateral, while national governments offered their own guarantees on newly issued debt. But unlike in the United States, confidence never fully returned to the banking sector due to the reasons listed above, and these provisions were never canceled. In fact, this program was expanded to serve a second purpose: stabilizing European governments. With economic growth in 2009 weak, many EU governments found it difficult to maintain government spending programs in the face of dropping tax receipts. They resorted to deficit spending, and the ECB (indirectly) provided the means to fund that spending. Banks could purchase government bonds, deposit them with the ECB as collateral and walk away with a fresh liquidity loan (which they could use, if they so chose, to buy yet more government debt). The ECB's liquidity provisions were ostensibly a temporary measure that would eventually be withdrawn as soon as it was no longer necessary. So on July 1, 2009, the ECB offered the first of what was intended to be its three "final" batches of 12-month loans as part of a return to a more normal policy. On that day 1,121 banks took out a record total of 442 billion euros in liquidity loans (followed by another 75 billion euros taken out in September and 96 billion euros in December). The 442 billion euro operation has come due July 1. The day before, banks tapped the ECB's shorter-term liquidity facilities to gain access to 294.8 billion euros to help them bridge the gap. Europe now faces three problems. First, global growth has not picked up sufficiently in the last year, so European banks have not had a chance to grow out of their problems. This would have been difficult to accomplish on such a short timeframe. Second, the lack of a unified European banking regulator — although the European Union is trying to set one up — means that there has not yet been any pan-European effort to fix the banking problems. And even the regulation that is being discussed at the EU-level is more about being able to foresee a future crisis than resolving the current one. So banks still need the emergency liquidity provisions now as they did a year ago (to some degree the ECB saw this coming and has issued additional "final" batches of long-term liquidity loans). In fact, banks remain so unwilling to lend to one another that they have deposited nearly the equivalent amount of credit obtained from ECB's liquidity facilities back into its deposit facility instead of lending it out to consumers or other banks. Third, there is now a new crisis brewing that not only is likely to dwarf the banking crisis, but could make solving the banking crisis impossible. The ECB's decision to facilitate the purchase of state bonds has greatly delayed European governments' efforts to tame their budget deficits. There is now nearly 3 trillion euros of outstanding state debt just in the Club Med economies — vast portions of which are held by European banks — illustrating that the two issues have become as mammoth as they are inseparable. There is no easy way out of this imbroglio. Reducing government debts and budget deficits means less government spending, which means less growth because public spending accounts for a relatively large portion of overall output in most European countries. Simply put, the belt-tightening that Germany and the markets are forcing upon European governments likely will lead to lower growth in the short term (although in the long term, if austerity measures prove credible, it should reassure investors of the credibility of the eurozone's economies). And economic growth — and the business it generates for banks — is one of the few proven methods of emerging from a banking crisis. One cannot solve one problem without first solving the other, and each problem prevents the other from being approached, much less solved. There is, however, a silver lining. Investor uncertainty about the European Union's ability to solve its debt and banking problems is making the euro ever weaker, which ironically will support European exporters in the coming quarters. This not only helps maintain employment (and with it social stability), but it also boosts government tax receipts and banking activity — precisely the sort of activity necessary to begin addressing the banking and debt crises. But while this might allow Europe to avoid a return to economic recession in 2010, it alone will not resolve the European banking system's underlying problems. For Europe's banks, this means that not only will they have to write down remaining toxic assets (the old problem), but they now also have to account for dampened growth prospects as a result of budget cuts and lower asset values on their balance sheets due to sovereign bonds losing value. Ironically, with public consumption down as a result of budget cuts, the only way to boost growth would be for private consumption to increase, which is going to be difficult with banks wary of lending. So long as the ECB continues to provide funding to the banks — and STRATFOR does not foresee any meaningful change in the ECB's posture in the near term or even long term — Europe's banks should be able to avoid a liquidity crisis. However, there is a difference between being well-capitalized but sitting on the cash due to uncertainty and being well-capitalized and willing to lend. Europe's banks are clearly in the former state, with lending to both consumers and corporations still tepid. In light of Europe's ongoing sovereign debt crisis and the attempts to alleviate that crisis by cutting down deficits and debt levels, European countries are going to need growth, pure and simple, to get out of the crisis. Without meaningful economic growth, European governments will find it increasingly difficult — if not impossible — to service or reduce their ever-larger debt burdens. But for growth to be engendered, the Europeans are going to need their banks, currently spooked into sitting on liquidity, to perform the vital function that banks normally do: finance the wider economy. As long as Europe faces both austerity measures and reticent banks, it will have little chance of producing the GDP growth needed to reduce its budget deficits. If its export-driven growth becomes threatened by decreasing demand in China or the United States, it could also face a very real possibility of another recession which, combined with austerity measures, could precipitate considerable political, social and economic fallout.